Wahoo RIBs has launched its latest superyacht tender, with the LX600 taking to the water near Southampton earlier this month (1 November). The 31ft tender completed a sea trial off Nettley Abbey before heading to the Thai city of Phuket where it will be handed over to its owner. 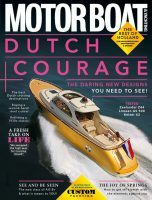 Powered by twin 300hp Mercury Verado outboard engines, this sporty model clocked a top speed of 60 knots on rough water. In smoother conditions, the company claims the LX600 can hit 65 knots. Its impressive performance was put down to the redesigned hull, which is the result of a collaboration with Southampton-based Spline Naval Architecture. Despite all this power, the LX600 can still manage 240nm before refuelling, thanks to its 400-litre tank. On board, the LX600 boasts a carbon fibre console with the Raymarine Empire Bus NXT touchscreen navigation system, and the aft seating area includes a teak table that can be stowed away in transit. Prices for the Wahoo LX600 start at £195,000 (excluding VAT).